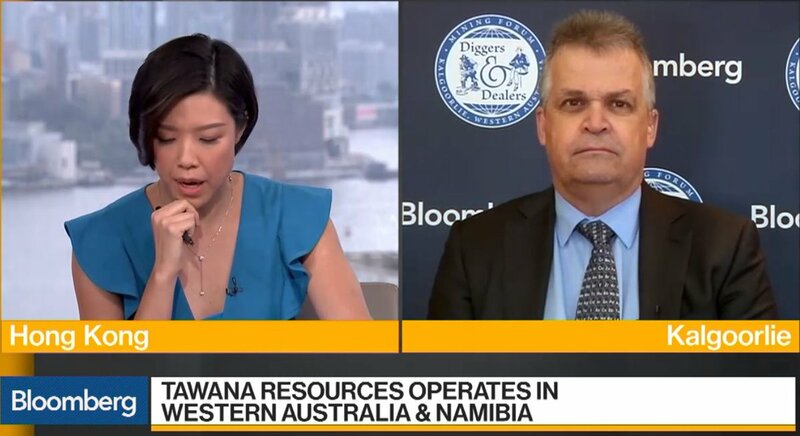 Mark Calderwood, MD of Tawana Resources, was interviewed on Bloomberg TV today. Mark spoke from Kalgoorlie, Western Australia, where he will be presenting, on Wednesday, at the Diggers & Dealers Mining Conference, the story of the Bald Hill lithium-tantalum project. This is a 50-50 JV project between ASX-listed Tawana and Singapore-listed Alliance Mineral Resources, both of whom are set to merge into a single entity. Q: ..... Why could it (Tawana's) be one of the best lithium concentrates from Western Australia? A: It's a coarse product and has low iron and low potassium and sodium so it's good for the converters. It saves them money during conversion. It also has high lithium. Q: On the outlook for the market, where you see and how much do you see in terms of demand? A: Demand is strong. There are a number of conversion plants being constructed at the moment that don't have supply, so the plants are being built and there are companies chasing feedstock for those plants. Q: There have been concerns recently about short-term oversupply. To what degree are those warranted, or do you want to tell people that this is not something to be nervous about? A: Well, we're not seeing it from the from the production end. Demand for product is still very strong. We're not seeing any issues with oversupply…. these companies are looking for long term contracts, they're looking for long term supply sources. The serious players in the industry that we talk to are not really worried about six-month or three-month movements in carbonate and hydroxide pricing. Q: End-users, whether it's battery makers or car manufacturers, I think this time around they seemed, as you were just mentioning here, a little bit more relaxed about the outlook. Do you see any potential issue in the next six to 12 months that could tighten the market? A: No, not necessarily. I think you're gonna have a steady increase in supply. Supply is behind, spodumene supply is behind expectations this year, and next year we'll probably still be under predictions in terms of supply. I think as supply increases gradually, and as more conversion plants are built, it'll be a steady increase of both supply and demand. I don't see any dramatic shortfalls anywhere or I don’t see any massive oversupply. Q: You're currently targeting production of about 155,000 tons a year of lithium concentrate. How much more beyond that can you actually expand and what options are you looking at potentially to grow more? MD Mark Calderwood will be the MD of the entity arising from the upcoming merger of Tawana and Singapore-listed Alliance Mineral Assets. NextInsight file photoA: For us it’s fairly easy for us to upsize our operation. Our plant is going well, it's going over nameplate. We can double production with actually quite limited capital spend. For as little as 30 million, we could double our production profile. We're one of the easy mines to upsize in terms of capital expenditure and we're in discussions with a number of potential offtakers that could take that sort of sort of supply. Over the next few months, we'll have a fairly good idea of the changes to our production outlook going forward.